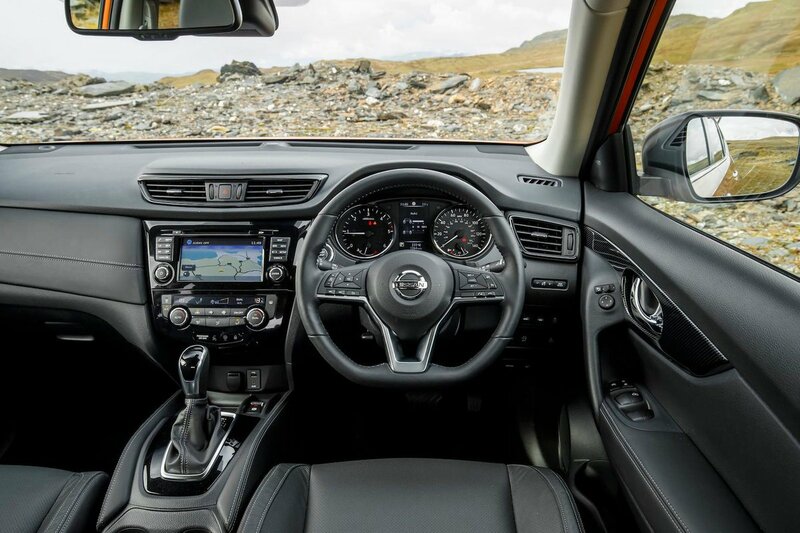 Nissan X-Trail Interior, Sat Nav, Dashboard | What Car? Adjustable lumbar support for the driver’s seat comes as standard from second-rung Acenta trim, which adds to the range of adjustment you get on all models; this includes a height-adjustable driver’s seat as well as reach and rake-adjustable steering wheel. It all adds up to a fine driving position, bolstered by the comfortable front central armrest that’s standard throughout the range. The only niggles are a headrest that’s tilted forward a little and an uncomfortably large gap between the slightly offset brake and accelerator pedals. The dashboard is clear and logically laid out, with controls all placed within easy reach. Buttons and switches are all large and easy to operate on the move, while their action is positive and precise. 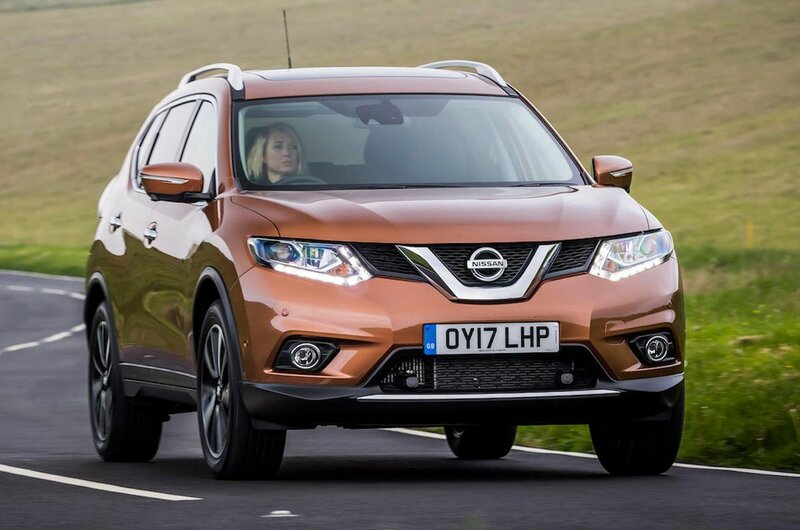 The Nissan X-Trail’s high driving position and broad windscreen provide good forward visibility, although the chunky door mirrors can sometimes obscure your view at junctions. Even with the big mirrors, rear visibility isn’t great due to the X-Trail’s fairly high rear screen and chunky rear pillars. This could be a bigger problem on entry-level Visia models, which don’t get standard front and rear parking sensors. A system that gives the driver a 360deg bird’s-eye view of the car’s surroundings is standard on N-Connecta models and upwards. This is more an issue on the lower Visia and Acenta models, which don’t get standard front and rear parking sensors. N-Connecta models and above do, along with a camera system that gives the driver a 360deg bird’s-eye view of the car’s surroundings. Entry-level Visia and mid-range Acenta models go without a touchscreen but do have a CD player, Bluetooth and a DAB radio, all played through with four speakers. However, most buyers opt for N-Connecta or Tekna trims, which have a 7.0in colour touchscreen and sat-nav. It’s not as good a system as you’ll find in a Skoda Kodiaq and Mazda CX-5, for example; the touchscreen is slower to respond to commands and the icons are quite a bit smaller and more fiddly to use. 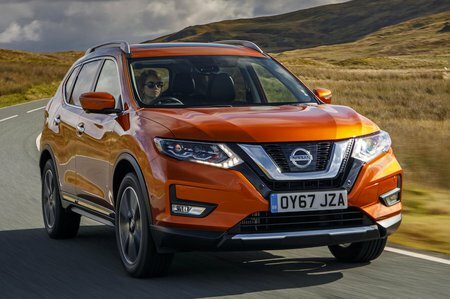 It’s also disappointing that Nissan’s system still can’t accept Apple CarPlay or Android Auto smartphone mirroring technology – something that most rivals have. On the plus side, the menus are fairly logically presented and the physical shortcut switches that surround the screen also help with swapping between major functions. A button that switches the screen off altogether is another useful addition for night driving. The X-Trail feels reasonably solidly put together. The dashboard features various textured, soft-touch plastics and contrasting silver highlights, and the switches are reasonably well damped. However, there are some flimsy plastics around the door pockets, and if you close the door you’re greeted to an unpleasantly tinny twang; this makes it feel a lot less premium than a fair few of its rivals. Materials further back in the car look more durable than plush, but you don’t find exposed metals or sharp edges, even underneath and around all the seat adjustments for the middle and (if they’re specified) rearmost seats.